On this date in 1917, someone was electrocuted in Rockview, Pennsylvania. 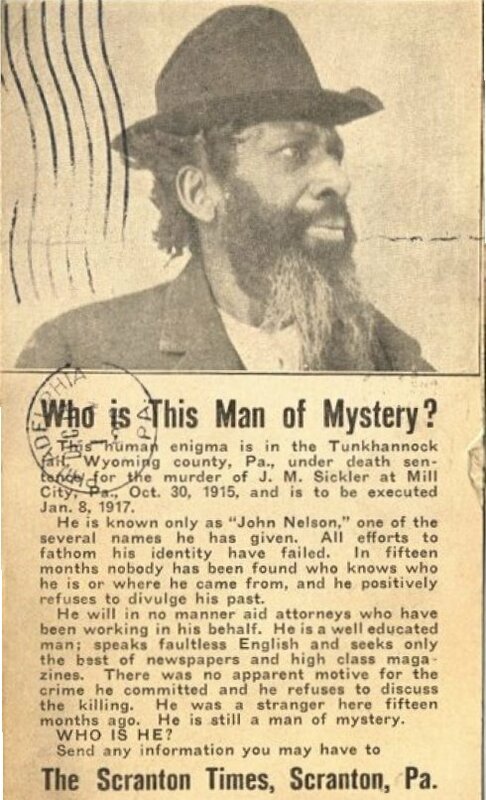 “John Nelson”, the cipher alias by which authorities were eventually content to call him, was 5′ 8″ tall and 165 pounds, and looked like an African-American. (“Nelson” himself said that neither white men nor black were of his race.) Papers put this about quizzically because he was also utterly steadfast in refusing to identify himself or his background. He eventually allowed that he came from Canton, Ohio (but who knows if that’s true). “He reads Shakespeare and seeks high grade newspapers and magazines,” ran news-of-the-weird wire copy all around the country. He boasts “long hair which bears the appearance of having been done up in kids to give a ‘Sis Hopkins’* effect” as well as “long gray whiskers, sideburns and a heavy mustache.” He looked maybe 60 years old. The Scranton Times sent 5,000 of these postcards around the country hoping to scare up information about their mysterious murderer. 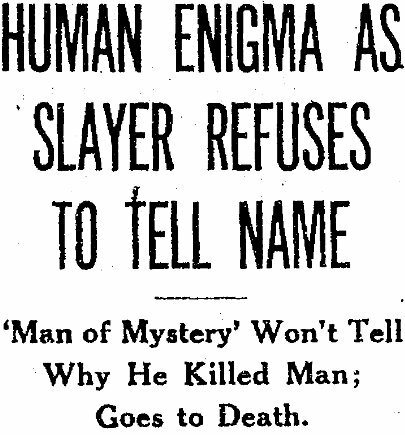 Although nobody could figure out who he was, everyone was pretty sure what he’d done. On the evening of Oct. 30, 1915, he’d trudged into Mill City, a Wyoming County township outside of Scranton, and made an unexplained sudden attack on three men lolling about a barbershop porch. J.M. Sickler, a prosperous local farmer, bravely intercepted the attacker before he reached Judge Robert Westlake, and suffered mortal stab wounds for his trouble. The attacker fled, but other locals roused by the commotion overpowered him as he escaped; Sickler lived long enough to give a deathbed positive identification. Of course, it wasn’t really “positive” — that’s the whole point. And “John Nelson”, whoever he might have been, kept his nose in his Shakespeare and his lips enigmatically sealed on the crime and its causes; on his background and biography; on everything whatsoever. “I just wouldn’t care to talk about that,” he would reply when questioned, or similar versions of that polite deflection. He kept his queer peace all the way to the electric chair. * Maybe Mr. “Nelson” was just taking Sis Hopkins’ good advice: “There ain’t no sense in doin’ nothin’ for nobody what won’t do nothin’ for you.” As Nelson blithely put it (and who could contradict him?) any name at all would do for his circumstances.